Pour the chicken stock into a large saucepan. Bring to a boil, lower heat to medium-low so stock is barely simmering. In another large saucepan pan melt the butter and olive oil over medium to medium-low heat. Add the onion and sauté for about 5 minutes or until tender and translucent, but not brown. Add the rice and stir to coat for about 1 minute. Add the wine and stir until most has been absorbed. Add 1 1/2 cups of the stock and stir constantly until it has almost all absorbed into the rice. Add remaining stock 1/2 cup at a time, allowing it to absorb each time. Continue to stir. This will take about 30 minutes. The rice will be creamy and soft, but al dente. 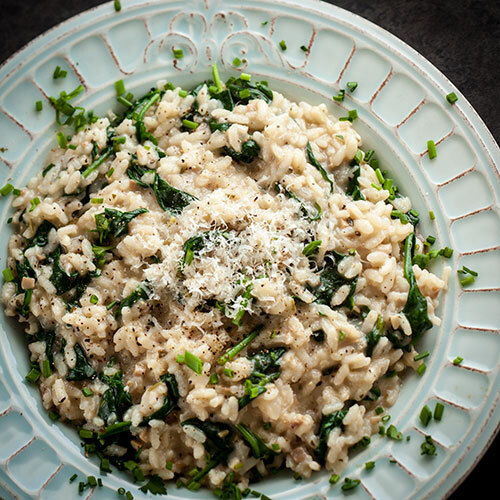 When all the stock has been used, add the Parmesan cheese, Truffle Spread and spinach. Season to taste with salt and pepper. Garnish with chives and additional Parmesan cheese. Serve immediately.